The revered collaboration—expanded with previously unissued material! 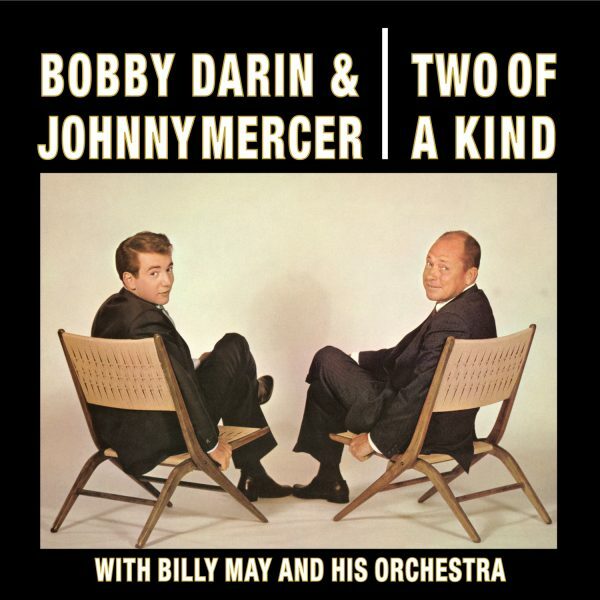 Anyone who is a fan of a swinging big band and pop vocals knows the names Bobby Darin, Johnny Mercer, and Billy May. But even if you don’t know those names, you know their sound. Their music is everywhere, being played every day, all around the world. Mercer had the distinction of being one of the founders of Capitol Records and the lyricist of some of the most beloved and recognizable songs of the 20th century. Billy May took the songs of the day, many of which are now standards, and set them to brilliant, swinging, swaggering arrangements for legends of the pop vocal era. Bobby Darin, a showman’s showman, could do it all, and did do it all. Originally based on an idea from Darin’s long-time manager Steve Blauner (who also brought the world television series like Bewitched and The Monkees, and classic films like Five Easy Pieces and The Last Picture Show), Two Of A Kind put these great talents together, in an homage to the great Tin-Pan Alley composers, and mixed it with the vibrancy that only these three giants could achieve. Years later, he revived his idea with Grammy®-Award winning producer Cheryl Pawelski, working through the session tapes, to present a fuller picture of just how much fun Darin, Mercer, and May were having during the original sessions. This new edition of Two Of A Kind features the original 13 tracks with 7 previously unissued performances—5 alternate takes, and 2 songs recorded for, but left off the album. These additional recordings offer a glimpse into the studio to witness the joy the artists shared in this collaboration. Newly remastered by Grammy®-Award winning engineer Michael Graves, Two Of A Kind has never sounded better. Sadly, Blauner (who not only discovered Darin, but continued to oversee his estate for the remainder of his career) passed away before his intimate look back at this classic recording could see the light of day. But now, the expanded edition is finally available for the world to experience. It’s apparent that a grand time was had recording Two Of A Kind, and now you too can revel in the fun!